Remember the one in school who always seemed to dress right–the one indubitably awarded “best-dressed” by popular vote–and who won so easily that his title was never in question? I often wondered if the mum of such a savant should have had the real credit for his ease and fortitude, and whether his actual award should have been that of “most obedient son”. Or, on the contrary, did this soldier-of-style have an innate talent to present himself eloquently almost from the time of his birth? I remember having admiration for these types who gave us the impression that they were well-bred and knowledgeable, if only through the way that they dressed. Even decades later, I recall the tailored chocolate brown velvet blazer that my classmate, Terrisina O’Neal, wore in Grade 7, and the yellow and blue wool argyle v-neck sweater with the bronzed-yellow tie that Chels Norton paired with his tan pants and polished loafers in Grade 10. This fascinating point of being able to recall a style choice (years later) stays with me, because of the simple fact that, if these two former classmates did not dress as they did, I doubt that I would even be able to recall their names today. And, if dressing well causes a person to be memorable, can these well-dressed soul’s “pomp” be more practical than we could have imagined? Of couse it’s obvious that men have a greater challenge than women when it comes to making style choices that causes them to be remembered (most preferably in a good way) because there are fewer choices available in the sheer number of accessories and clothing pieces offered for men versus women. 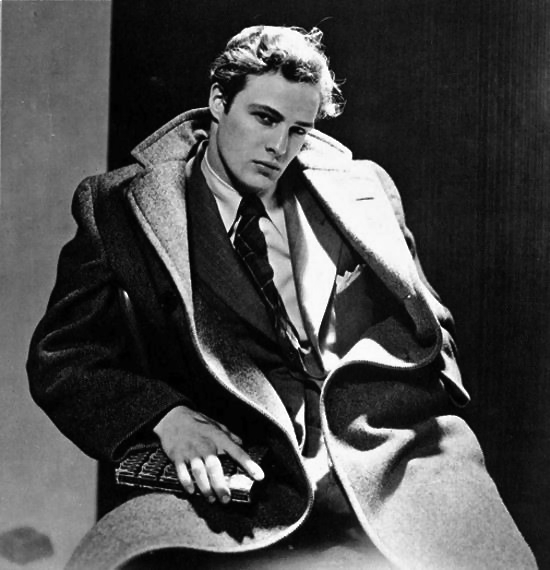 But even so, we see men who, ever-so-slightly, push the envelope in order to nab a definitive style for themselves. Yet with men and women alike, the feeling is the same when it comes to the satisfaction of “owning your style” and in finding your own rite-of-passage in the field of elegance. 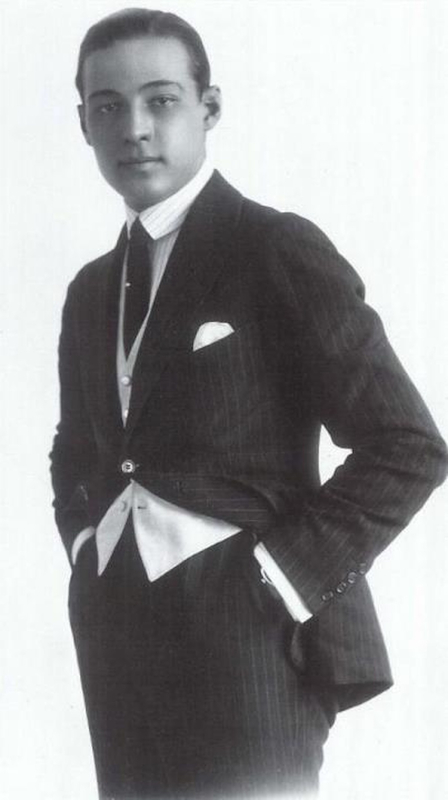 Taking the historical men’s suit as an example, what gives a little pomp…just enough to be remembered? Here are six examples that tend to leave memorable impressions. There are three things that I notice right away about this style: the arched tie, the pocketsquare, and the contrasting button-hole stitching. 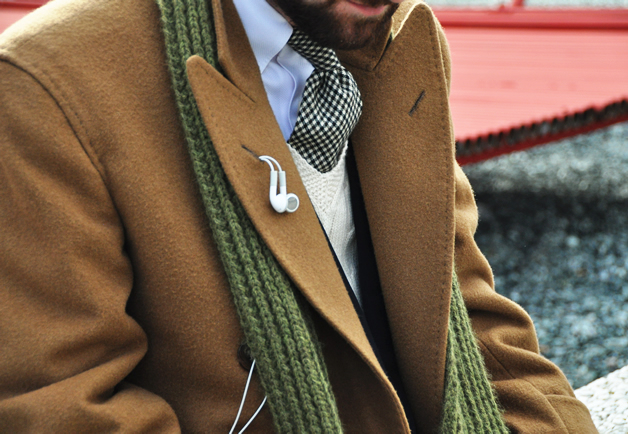 This look feels like it is understated but still holds a strong sense of style. And, this combination of style elements definitely allows for focus on the man instead of his clothing. It is not overdone, but nonetheless displays a lot of flair and individuality. The pocketsquare itself is not a duplicate of any other color or pattern (over-matching a pocketsquare to other fabrics and patterns worn comes off as looking fussy and unimaginative), but is simply white in color with interesting stitching–a fine complement to this overall look. 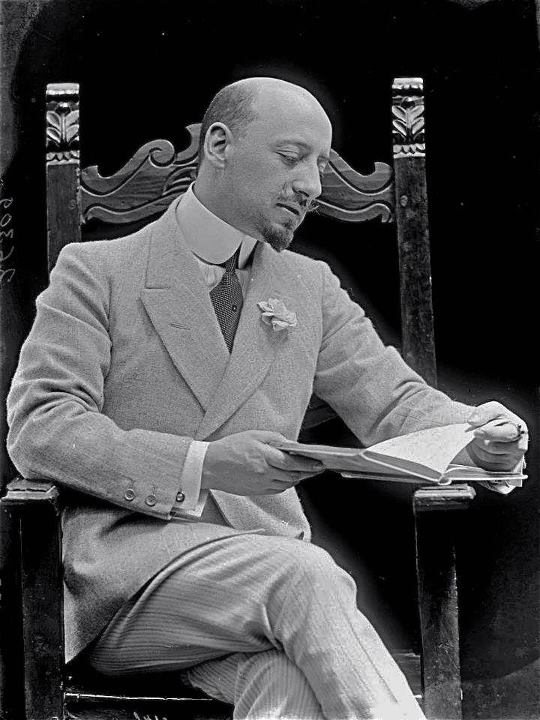 A properly arched tie does not fail to intrigue…it makes me wonder how it was managed and just how one uses a tie slide…and what special twist or push or positioning caused it to look so steeped in 19th century tradition? I adore this way of wearing a tie and it is pleasing to see this effect carried off well. The red stitched button hole is bold and shows a willingness to take risks and seems to communicate at slight sense of adventure. 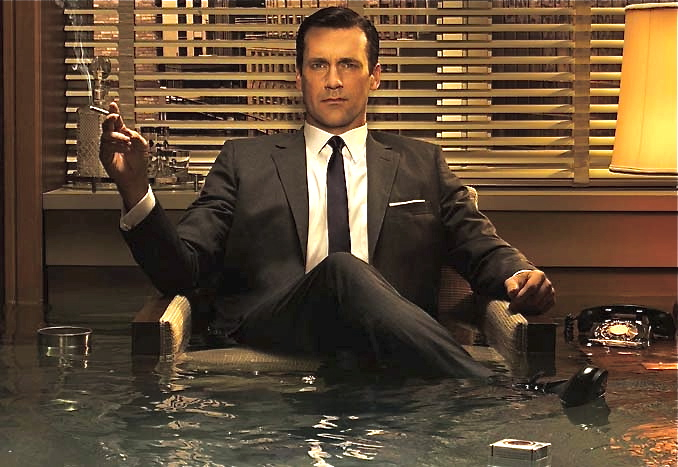 Even waist deep in hot water, Draper pulls off the ultra thin tie with ease. 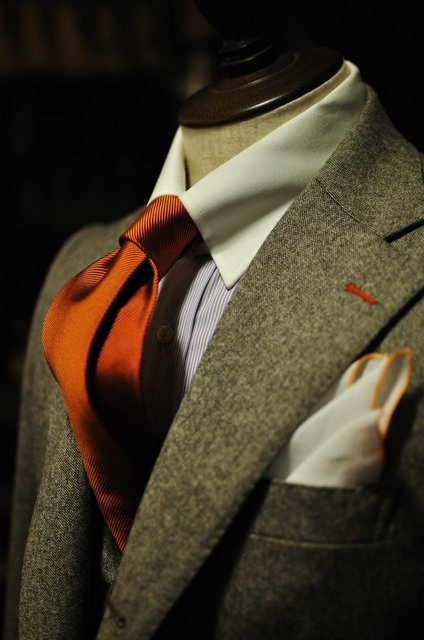 Another tie twist is opting for the ultra thin tie, inspired by the 1960s era to complement a suit. Don Draper from the series Mad Men has become an icon for sporting this retro look. 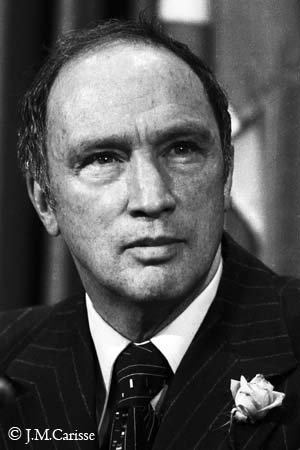 Perhaps no one has carried off the rose boutonniere better than former Canadian Prime Minister Pierre Elliott Trudeau, whom, on the day of his funeral, caused a sell-out of roses at Canadian florists because of the sheer volume of men who sought rose boutonnieres on that day in to commemorate his memory. This little article of nature seems to be worn by men in a class of their own. If this look is worn consistently, it is hard to imagine anyone who would not be impressed with the fortitude of the man donning a boutonniere, especially considering his effort in arrange for something fresh to be worn regularly that also gives pleasure to others, most of whom can appreciate the beauty and simplicity of a single flower. 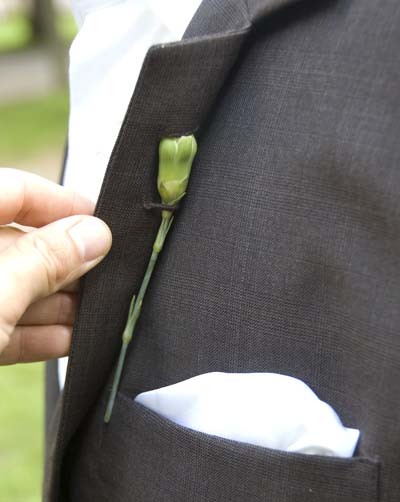 A working lapel button-hole with a boutonniere latch raises the bar in the world of boutonnieres. I find this small touch to be impossibly elegant. 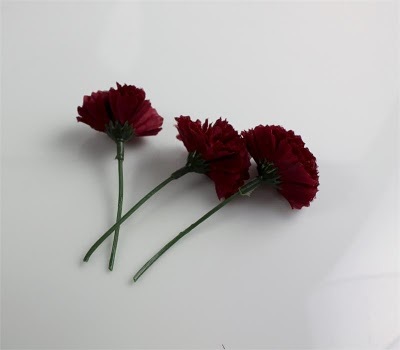 One of the most understated choices for the boutonniere, the scarlet carnation. If you like to hold strictly to tradition, wear a red flower if your mother is living and a white flower if she is not, as is the custom in several parts of the U.S. and abroad. A more modern twist on the use of the lapel notch. Obviously, an amazing timepiece is something that can bring great pleasure to a man. Yet, it can be of benefit to a man to notice how he wears his timepiece. For example, it isn’t becoming of a man to pose for a photograph after noticeably pulling one sleeve higher than the other, thrusting his wrist forward and tilting his timepiece ever-so-towards the camera. This move is blatantly apparent to others who look at his picture. Even when a man is not posing for a photograph, constantly extending the arm forward to show off a timepiece smacks a bit of of desperation, and can be off-putting to others. However, when catching an accidental peek of a fine timepiece worn by an elegant man, that man is more likely to be viewed as a person of deliberation and success, not as ostentatious and overly proud. Conversely, a discreet man seems to enjoy functionality and style, and is more than adept at expressing himself well, even in regard to his selection of jewelry. Finding a fine timepiece can be a memorable life experience. The research, anticipation, and finally, the reward of owning an item that is both a technical and beautiful, as well as a constant companion, can provide great satisfaction for decades to follow. 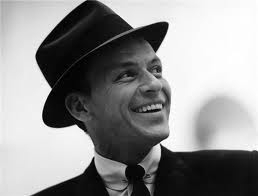 It seems as if it would have been a waste for Frank Sinatra not to wear a hat. There can be no question that this man was made to don un chapeau. It is also a bit of a loss for many other men who have the correct face shape and dimensions to forego placing a fine Fedora, or the likes, a top of their heads. My father always carried a freshly laundered handkerchief in his inside jacket pocket. He would offer the handkerchief to those closest to him, should they have a slight spill, need to wipe their hands, or find themselves unexpectedly emotional. This sentiment of offering a handkerchief to someone remains with me. It is these small subtleties that causes a man to become memorable and is testimony that real pomp comes not only from outward appearances, but also from subtle and sincere gestures of grace. “…the extra touch…” nicely said. 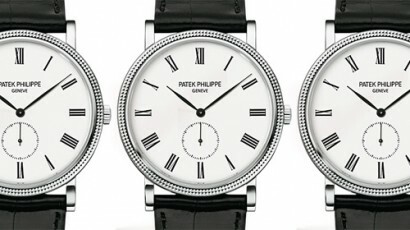 I still love a watch (for a man or a woman). I especially love a pocket watch for men but with today’s technology we see less and less men wearing wrist watches and the pocket watch has, sadly, disappeared almost entirely, except for collectors. Lovely post. Ryan Gosling dresses very well, one thinks. You’ll probably enjoy Gangster Squad, then, as Gozzers and Josh Brolin (amongst others) are dressed as you’ve mentioned here! Myself? I only wear bright orange clothing. Why? No idea. George Clooney and Brad Pitt gets that right every time.From work boots to tuxedos,Brad Pitt looks effortlessly stylish in anything he wears and George Clooney is undoubtedly one of the most charming man ever in suits or just anything.They both exude tremendous confidence every time. 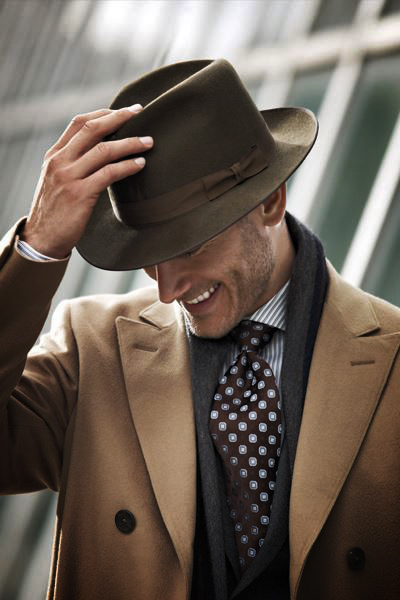 Hats are timeless, but very few men can pull wearing one off without learning to do it. Sinatra was a natural, so was Sean Connery – but for the most part a man has to find his hat to wear and learn to wear it. I have learned to wear a trilby and a stingy brim and now I am taking on the challenge of the Homburg – the second most terrifying hat ever designed by a German! As always, amazing post! I am extremely fortunate to be in the beautiful company of my stylish husband every day. He pulls off casual and dressy with a careless demeanor, and I think that is a major component for both men and women, but especially the guys. The walking window display guy is just that. The truly stylish guy is something else. Love the blog and the pictures you chose for it! Great post. i never thought about it that way. That they just wear what their mums got them. I’ve always imagined all teenagers hate that. My sister is 7 years younger and I would always style her outfit on the ‘uniform free’ days she had at high school – the day when all school kids try to impress each other with the clothes they chose to wear. I was already working as a graphic designer making my own money so I could afford lots of nice edgy clothes and accessories. Everyone at her school thought she was a fashion goddess, she put every other girl to shame and they all totally admired her style and some hated her for it too! LOL. Little did they know it was me who dressed her. She was my styling guinea pig back then. Great article, I will forward this to my sons for pointers.